On Tékumel, “low” cartography is the use of flat maps. “High” cartography utilizes sculpted objects. Unreadable to the common person, they convey great meaning to those trained in the art. Although the net result is to conceal information from the untrained, this is not the stated goal of High Cartography. Since Tsolyáni people have paint and ink and scrolls, why would humans use esoteric three-dimensional items that take a great deal of effort to produce? Let’s look at a couple of real world parallels for insight. The closest thing to High Cartography is probably the travel carvings made and used by indigenous people of the Arctic Circle. 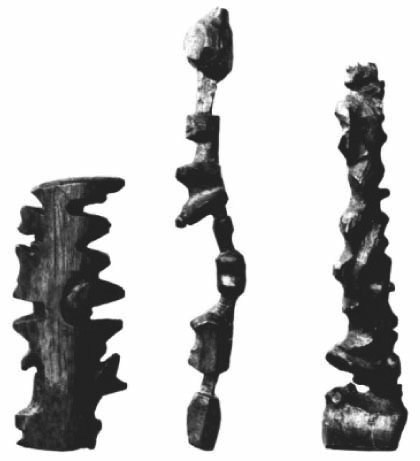 These three are Inuit reference tools that describe the coast of Greenland. They are made of wood. They show the fjords and the landforms visible from shore. This information would remain valid for centuries. So, making a carving might be well worth the effort. What are the advantages of this method over flat maps? First, they’re for use at sea- markings on bark, parchment, and paper are less durable. Second, they were so far north that their world was plunged into twilight or night for months. There was very little light by which a map could be read. In the South Seas, another tactile “map” device is the mattang. This is a “teaching” mattang. It doesn’t represent a particular island, it’s a diagram of what generically happens when wave fronts flow around an island. Mattangs are meant to be readable in the dark. Experienced sailors also didn’t look at the water. They could sense the direction and magnitude of the waves by paying attention to the angle of the canoe pitching beneath them. Even if they were far from sight of land, they could follow the wave fronts to find an island. Here is an actual mattang of the Marshall Islands. It’s made out of cowry shells, sea grass, and palm “twigs” from the center rib of a leaf). Called “rebbilib” there, these were still in use until about World War II. Polynesians in their great canoes often slept through the heat of the day and rowed by night. They also caught seafood that rose to the surface at sunset and night. It was important to have reference that worked in darkness. Mattangs are traditionally learned by touching the various components and gently tracing them. One ancient Polynesian belief was that there was a different repository for memories of this kind, “body memories”. Today, we do know that some people are more effective at learning and memorizing if there is a kinetic or tactile component. High Cartography would be more memorable for some people. Inuit sticks and Polynesian mattangs are meant to be portable. Some of the High Cartography objects mentioned are quite large, and not meant to be carried around. Are there such things on Earth? Why, yes! This map is in Libya in a well-hidden location. We can infer that it was meant to be memorized because it’s carved into the rock face. Somebody could not carry it around if they wanted to. It’s remarkable that the Wadi Tashwinat map has lasted so long. Wood, bone, paper and leather are devoured by mildew and beetles. Steel is extremely rare and copper turns to greenish black powder. Even glass just becomes a lump because it is a slow-moving liquid. Given those alternatives, then, it makes sense that some scholars of Tékumel might prefer carven stone. They’re aware that humanity has lost vast amounts of information. They want the fruits of their labor to last many millenia, and they do. It’s possible that High Cartography didn’t originate with Humans. It might have come from a people that naturally lived in near-dark or even an eyeless species. This might be interesting to speculate but that speculation would be weak since none of the canon sentient races fit this description. It could have come from a race whose predilection for a soggy environment made technologies like ‘paper’ problematic. The Shén, for instance, are fond of swamps, but there’s no mention of such technology. So, this is another weak ‘maybe’. According to the canon, there are devices from bygone eras that contain information that are conveyed through “magic”. The user touches them, and hears a voice in their head. Could it be that perhaps High Cartography was an attempt to cling to the custom of conveying information through something you fondle? Desperately trying to look like the ‘Great Ancients’? Well, maybe, but, again, I’m venturing into speculation, and it’s not really necessary. Whatever its origins, High Cartography is a revered tradition, perpetuated by scholars of the wisdom-oriented temples. All in all, while it might seem farfetched, there’s already plenty of precedents in the real world to show that it’s a viable idea. This picture was sketched during GuadaComaCon 2012.